Commemorative interview with #1 bestselling author, Summer Lane, celebrating her 20th release in 5 years. Courtesy of Writing Belle Publishing. This is both the launch of a new series and your 20th bestselling novel in 5 years. How does that feel? To be honest, it feels like it’s been about 15 years. I can’t believe it’s only been 5 years since I started writing Cassidy’s story for readers around the world. We’ve come so far! I feel accomplished, satisfied, and excited. I’m looking forward to working on this new series over the next few years. Cassidy Hart is near and dear to my heart, and I’m thrilled that her stories are enjoyed by so many people. How is Resurrection different from Collapse? In Collapse, the story is about militia groups and average people rising up and becoming soldiers, warriors, and leaders. It’s about Cassidy Hart growing from a naïve but good-hearted teenage girl, into a battered war veteran and military leader. In Resurrection, we get to examine the aftermath of the global war and see Cassidy begin the story as a confident, mature, and badass woman. We get to see a new type of threat to our heroes. This book is slicker, faster, grittier, maybe a little darker. I totally love it, because Cassidy Hart is finally exactly where I want her to be: in charge and in control. How do you produce 20 books in 5 years? That’s fast! First of all, it’s my job, so I have a very efficient system and structure for creating my novels. Second, I enjoy writing, so that makes it a little easier. Third, I’m a fast writer by nature. Some people take more time with their manuscripts, but I find that I do my best work when I just get it out. I’m actually slightly astonished, too, that I’ve managed to produce so much in such a short amount of time and have each one be a success. I’m so lucky to have such amazing readers – and copious amounts of coffee! What’s the plan for your upcoming books? 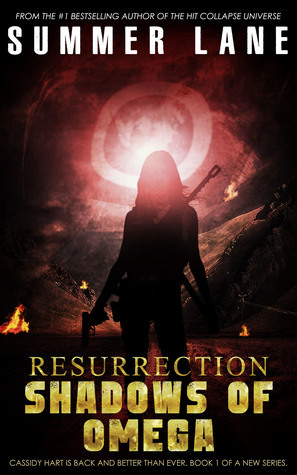 I plan to keep the Resurrection Series similar to Collapse in that you can expect 2 releases a year from Cassidy Hart. At this point, I know that there will be at least 6 novels in the set. As for my other projects, I can’t announce anything yet, but I am working on some fun storylines on the side in what scant free time I have, haha.